The 2018 season so could have been the season for the Saints. They lost a painfully close NFC Championship game (I’m not going to relive it here) after a regular season that saw them finish with the league’s best record and best point differential. The good news for the Saints, though, is that the only significant piece of this year’s team heading into free agency is running back Mark Ingram, and with Alvin Kamara playing like one of the league’s best backs the last couple years, Ingram has become expendable. The Saints don’t have a big load of cap space this offseason, but considering how close the team is, it doesn’t need to do a whole lot. 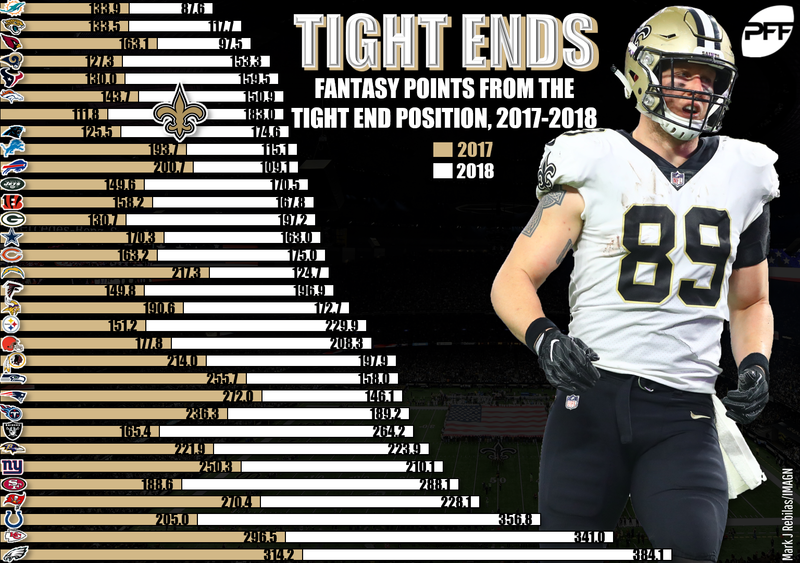 The Saints have struggled to figure out a pass-catching tight end option since Jimmy Graham left town. Coby Fleener never developed into the fantasy performer some expected him to be (not me, for the record, if I can brag about one third-tier prediction from three years ago). Benjamin Watson, brought back to New Orleans before last season, only had 400 yards and two touchdowns in a disappointing season before heading into retirement. The Saints should still be one of the league’s best teams in 2019, but this is a team with a closing window who would do better to get an immediate contributor rather than draft a lottery ticket at a position where players typically need time to develop. Cook, off the best year of his career, probably doesn’t have a lot of years left as a fantasy-relevant option, but pairing him with Drew Brees in 2019 would keep his ceiling high, give Brees an option at a position he hasn’t used a lot lately, and be tantalizing for fantasy. The popular thought about the veteran Lynch coming off a 2018 season that ended early because of injury is that we’ve seen the last of him. The thing is, though, that he hasn’t said that … and considering he did retire once and even that didn’t take, the only way to believe it is to see football happen without him. Maybe Lynch wants another year and another shot at a Super Bowl. He definitely still had his skills in 2018, finishing fifth in the league (among backs with at least 60 carries) in both elusive rating (85.6) and yards after contact per attempt (3.46). Lynch could probably come on the field right now after not having played in months and force a missed tackle or two every four or five touches. In New Orleans, with Kamara dominating the workload, that’s all Lynch would have to do. He could still have plenty of playing time, a la Ingram last year, but not be needed to be the workhorse he has been before in his career. It’s probably the best landing spot Lynch could find if he wants to play another season and contend for a ring. Brees is still one of the league’s best quarterbacks, a bona fide MVP contender in 2018. But he turned 40 in January. The clock is definitely ticking — which we’ve said for half a decade now, but it’s still true. Teddy Bridgewater was around in 2018, but he’s a free agent again now, and you’d have to imagine the number of teams around the league needing a quarterback means Bridgewater will have chances to sign elsewhere and start. The Saints are enamored of Taysom Hill, but he appears to have the future as more of a gadget/creative player than as a full-time starter. Maybe this is the year the Saints look to draft and develop their eventual Brees replacement. It would be hilarious if the team looked to replace the notoriously shorter-than-typical quarterback Brees with an even shorter guy like Kyler Murray. That’s unlikely, as are most of this year’s high-end quarterback options, considering the Saints have only one pick (a second-rounder) through the draft’s first four rounds, but it’s worth exploring the position.